The sleeping face emoji depicts a calm face, snoozing away without a care in the world. Used in all kinds of posts that revolve around sleep and boredom, it's also referred to as the snoring face and sleep face emoji. Time for a nap, I'm off to bed now. Nighty night Luciverse, sleep well 😴 or whatever time it is with you. 😉 Tweet ya tomorrow. You’re feeling sleepy … very sleepy. 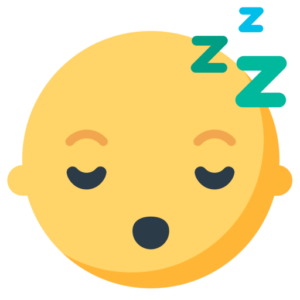 The sleeping face emoji was approved as part of Unicode 6.1 in 2012 and added to Emoji 1.0 in 2015. On all platforms, the traditional “zzz” is used to represent a peaceful, content snore, a vision that might annoy the insomniacs amongst us. Why “zzz,” you might ask? Well, it’s one of those onomatopoeic words, where the “z” sound replicates—to some degree—the sound of a snore. We think the Mozilla platform version looks like an infant as the screenshot from Emojipedia shows below. Awwww. From humorous posts to frustrated ones, from animals to sweet-smelling babies, the range of images and messages that are used along with the sleeping face emoji is huge! Beware, some of these may have you … feeling … sleepy.